More than 700 Lagoon 380 S2 catamarans were delivered in 2013. That makes it undisputed world champion in its category. It’s easy to manoeuvre, fast and safe, with army of superfans spread across the world’s oceans. Enjoy life while sailing Cyclades islands in this comfortable, welcoming and seaworthy vessel. With simple and efficient deck layout, vertical glazing provides better protection against the sun and optimizes space and headroom. It is available in 3 or 4 cabin layouts. Move around safely and easily thanks to wide side decks and a rigid walkway on the trampoline. 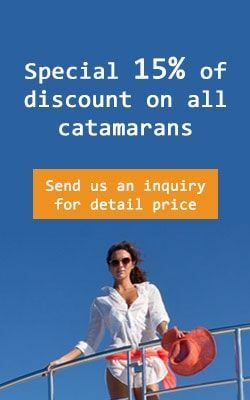 Send us an inquiry for Lagoon 380 S2 catamaran charter in Greece, and book your boat on time!